Welcome to the New 1125R and 1125CR owners section, with one easy to access spot for information about common issues/fixes and frequently asked questions. Feel free to start a new thread or post in the message box below. Puzzled's De-noid procedure with pics. De-noiding not nesc. if you have the last flash. De-noid makes a smoother lighter throttle though. And drops about 2 lbs. I've heard others rave about the freed-up space as well, but I haven't personally noticed any benefit from that. Anyone else put something there? For those of you who do your own servicing, here is a sheet I made up for myself and another local owner to help keep track of the steps and allow us to keep receipts, etc. when we do our own servicing. This is just the 620 service. I'll make the other sheets soon and post them. Thanks Wayne for going thru the trouble to make these sheets! Ccryder, I found a way to make links to other threads, see "XB-S and X pegs on the 1125" above. If you think this is a better setup, I will do it to all your links, that way info is more centralized. If you can show me I'll do it too. Next task is how to keep this as a "sticky"
As for keeping it a sticky, I can force this to become an archive, so it won't get archived. It can still end up at the bottom of the topic page though, so I will put a link above the threads where the owners manuals and junk are. Anybody experience a sticky throttle on their 1125CR while over 100? I've got a 09 1125CR with dealer installed high bar kit and while blowing out the cobb webs along side a Shelby GT500 (which passed me at 130 like I was standing still) yesterday and the throttle stuck (meaning I had to push it forward to slow down) at 128 and then again at 104. I've never had that happen while below 100. I recently bought a 2008 1125 cr. The bike came with 10000 km(around 6000mls). Equipped with a Barker's exhaust and special mapping. After a couple of rides the bike would turn of after a cold start(only have time to ride in the weekends and the weather is bad here in Holland at the moment)after running for about 30 seconds. Fired it up again and the same happened, after a couple of times repeating this it would keep running without any problems. Last friday i decided to hit the free way(ride was 20km/12 mls only) for the first time. Visited a friend of mine and everything was still fine. Until i wanted to return home, i fired up the bike and to lights appeared, the battery light and the yellow engine light. Bike was still running ok so i stopped and turned it off to fire it up again hoping the lights would disappear. The bike almost did, like the battery was empty(i just replaced this a couple of weeks ago), not start and pulled all the power from the dashboard and the lights, finally it started and i went on my way. At the highway again, the bike started to hold back and cough a little. The message "battery or voltage problem"or something like that showed up. As i stopped and as i pulled the clutch the engine turned off as well did the dashboard. As i was parked on the emergency lane i turned the lights on and the front part worked, the emergency light(turn signal lights) on the front worked also. The back turn signals did not work, the brake light did. 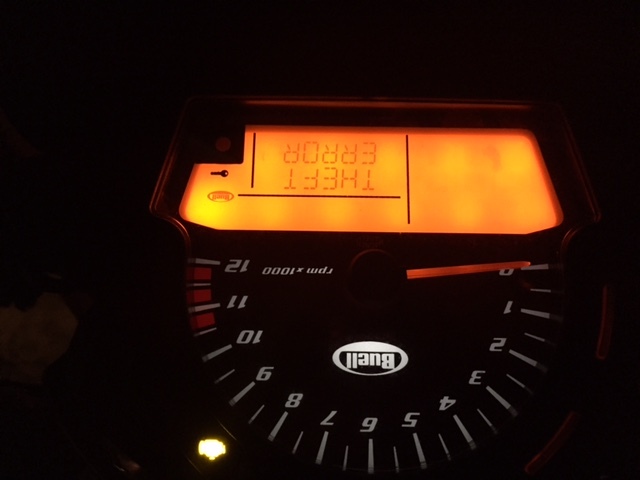 The dashboard started to flash on and off by itself and the message "theft error" appeared. Does anybody recognize these symptoms? Is this known as a burned stator or just something more minor? I hope anybody can advise me, thanks!